Communication sites are now rolling out to Office 365 First Release customers, followed by full worldwide rollout to Office 365 customers in the coming months. Join Microsoft for one or more events in the coming days and weeks to share and explore the value of communication sites. 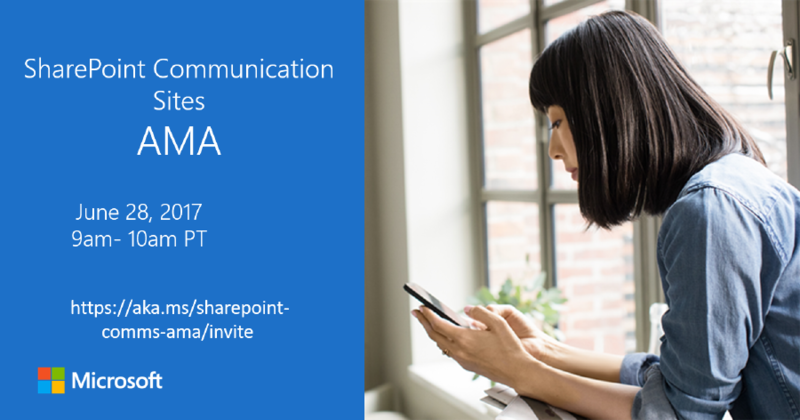 SharePoint communication sites AMA—On Wednesday, June 28, 2017 from 9–10 a.m. PDT, bring your questions and feedback to the SharePoint communication sites AMA within this dedicated SharePoint community space of the Microsoft Tech Community for SharePoint. We’re inviting our deepest business and technical subject matter experts for an active, informative hour—driven by YOU! Jeff Teper takes over @SharePoint—On Tuesday, July 10, 2017 from 9:30–10:30 a.m. PDT, Jeff Teper, corporate vice president for SharePoint, OneDrive and Office, will take over the @SharePoint Twitter handle. He’ll tackle your questions and feedback both with written responses and video snippets as only he can—no tweet left behind! LIVE customer + MVPs panel webinar—On Wednesday, July 13, 2017 at 8 a.m. PDT, join in to hear how one of our customers, Shire, successfully planned and implemented their new digital workspace—inclusive of communication sites. You will hear both from Shire employees and Office 365 MVPs. Register today.